flame arrester plate for Citroen and Peugeot corr. 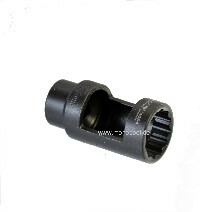 Bosch 2 430 190 002. This flame arrester plate is essentially required when changing the injector nozzles. It protects the nozzle from the combustion heat. Please check the reference list (s. datasheet), whether this flame arrester plate was originally built in your car.